Know thy customers – this is a mantra every hotel owners and managers need to imbibe in today’s ultra-competitive hospitality business. In an industry wherein almost everyone offers the same thing, personalization is key in generating repeat clients as well as building a positive brand image to acquire new clients. Take a look at the last statement. Personalization will be a requirement to stay in the game. So, there’s the scary truth. If you continue operating a run-of-the-mill hotel offering nothing unique, you’re bound to close down a few years from now. The primary reason that a lot of hotels still lack the personalization guests crave for is the cost involved. Take for example the recent revamp Four Seasons did to their website. They made a cutting-edge revision to their site allowing the hotel to deliver personalized dynamic pages to potential guests. The cost of this project? A whopping 18 million dollars. Of course, not everyone has the budget and guest profile that Four Seasons has. However, this does not mean that you should not strive for personalization experience. Grand gestures are great, but you’ll be surprised how small things can get you a long way. 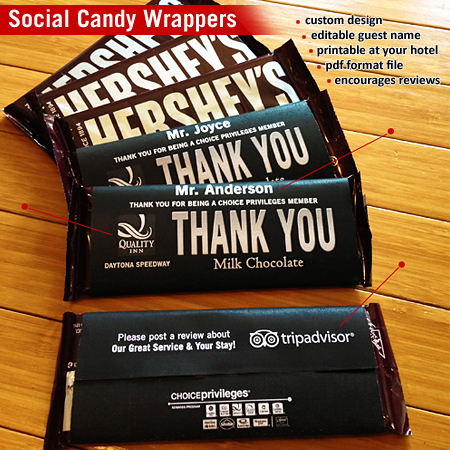 Get Here: Print your own Custom Candy Bar Wrapper with Guest’s Name at your hotel. Recent experiments involving MRI or magnetic resonance imaging showed how the “pleasure sector” of our brain lights up when we see our name. This is why we are annoyed when we receive letters that open with Dear Sir/Madam. Some say this is part of our reptilian instinct. It may also be because whether we admit it or not, there’s a Narcissist in every one of us. SmartGuests.com offers inexpensive ways that will allow you to harness this instinct and deliver a personalized and memorable experience hotel experience to your guests. You can put your guests’ name on our Custom Candy Wrapper PDF Template (personalize your candy bars for less than $0.50 each). It’s not as extravagant as what Four Seasons may do, but based on our experience using these products, we can say that these simple and inexpensive gestures are effective in creating a perception that your hotel takes personalization seriously. This might be a cliché, but at the end of the day, it is indeed the thought that counts. There are other simple and inexpensive things that you can do – asking beforehand the room temperature your guests prefer so you can set it beforehand. Any special diet they have so you can recommend a local restaurant. Deliver a hand-written letter or card to guest room. Reserve a table during breakfast with a sign. Can you think of any more personal touches? Write them in the comment box below. It’s really a practice of tailor fitting every possible aspect of your hotel’s services to the specific requirements of your guests. Money may be a factor, but it should prevent you from personalizing your services.